The Ten Frame is a very important math model! We us it to help us identify numbers based on landmark numbers (5, 10), break apart numbers to find parts, to see numbers as tens and ones, and to add and subtract numbers. Wow! Balloon Pop Subtraction, from ABCya.com, is great fun for all kids learning subtraction. Kids are presented with subtraction problems and need to pop balloons to show or find the solution. There are 3 levels of difficulty, a bonus round, and score reports. 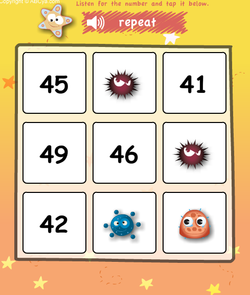 Connect the Dots, from ABCya.com, helps children practice counting numbers and recognizing numerals while connecting the dots to reveal a fun picture. 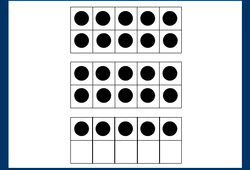 Connect the dots by counting 1 to 40. 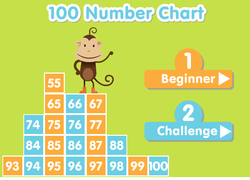 The One Hundred Number Chart Game (ABCYa.com) is a fun and educational activity for children learning numbers. The chart will help children to see relationships and patterns between numbers one to one hundred. To play the game children must place numbers on the correct spot of the chart. Beginner: reveals one number line at a time and only two missing numbers at a time. Advanced: shows the entire number chart and twenty missing numbers. There is a funny surprise at the end of the activity. 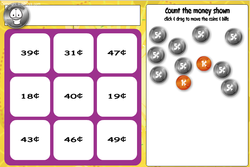 Money Bingo is a fun and educational game for kids to practice counting money. BINGO grid size options and the ability to select difficulty (pennies, nickels, dimes, quarters and bills, or another combination thereof) makes this activity good for kindergarten through grade five. Have fun learning to count money! Numeral Order -- putting numbers in order -- is a fun elementary computer activity for kids at home or school. Children practice number sequence by arranging numbers in ascending order. Numbers are presented in sets of ten and the difficulty can be adjusted by selecting a level before playing. Help the monkey get his bananas! Number BINGO is a fun way for children to review numbers 1-100. 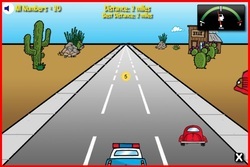 Children can choose between different levels of difficulty by selecting a range of numbers. Students must match up numbers with audio clips of their names. Three in a row makes for BINGO! Practice identifying numbers as groups of tens and ones with this fun Base 10 Bingo game, from ABCya.com. In Number Race, you will practice identifying different numbers: odd numbers, even numbers, numbers less than 20, numbers greater than 30, etc. 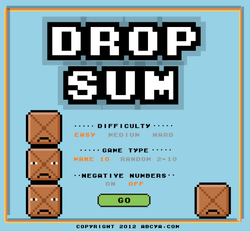 Drop Sum, from ABCya.com, is an 8-bit style math game for kids to practice addition. It has 2 modes of play: Make 10 & Random. In Make 10 mode kids must add falling blocks together to equal 10. 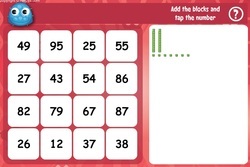 In Random mode kids must add falling blocks together to equal a range of numbers 2-10. The goal of Drop Sum is to collect as many coins as possible by correctly adding together blocks to equal the target number. The game is over when a stack of blocks reaches the top of the screen. 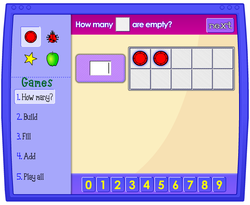 In this Flash Practice game, models of numbers (as base 10 blocks, 5 frames, ten frames, or multiple ten frames) flash on the screen for only a few seconds. Try to identify the number using landmarks (e.g. 10), without counting by ones! Beat the clock! And challenge yourself to use larger numbers (e.g. multiple ten frames or base 10 blocks).